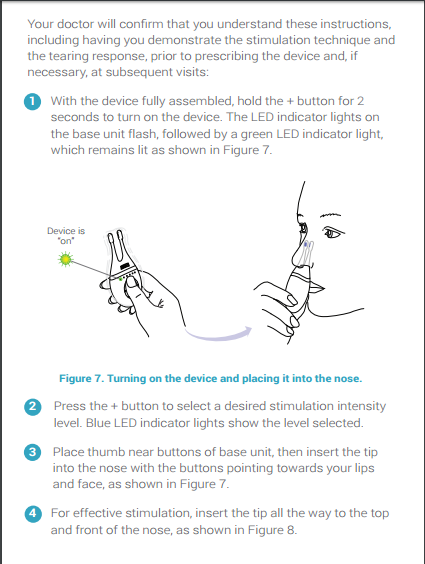 If you are left a little baffled by your first glance at TrueTear, Allergan's recently FDA approved intranasal tear neurostimulator, you aren't alone. The idea of a device inserted in your nose to produce natural tears gets a lot of confused glances. Although you're first instinct is to think this device somehow causes your eyes to water in the manner they do when you pluck a nose hair, think again. This device actually helps patients emit their own, normal and natural tears -- not an irritation driven watering response. 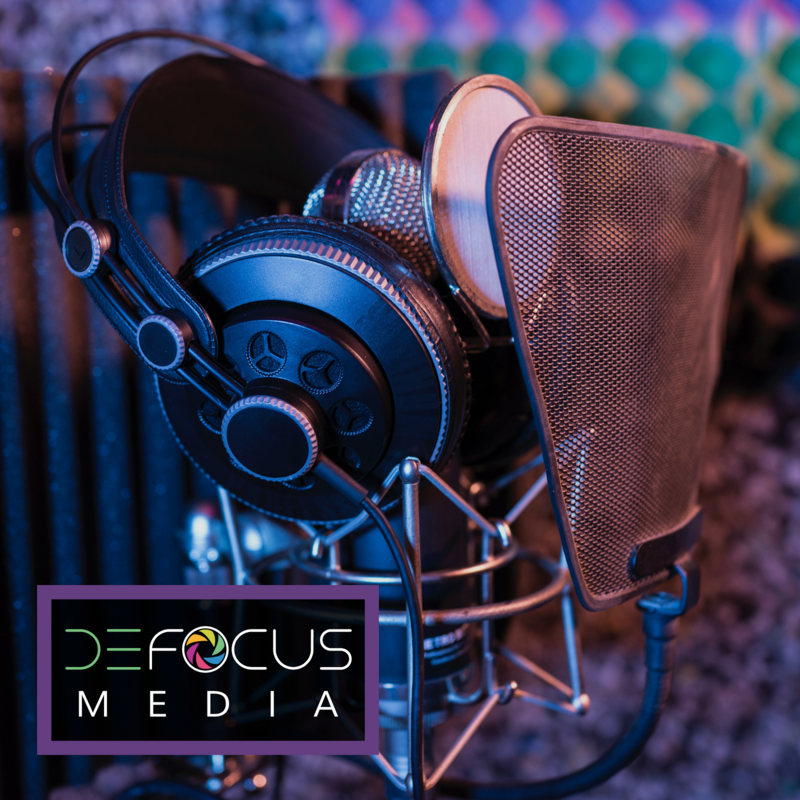 Neurostimulators have been around for decades, but the technology is new for the world of eyecare. Common neurostimulator devices used in everyday healthcare include pacemakers and cochlear implants for hearing loss. TrueTear is a neurostimulation device that emits micro-electric pulses to the nasal cavity to stimulate the lacrimal gland and the trigeminal nerve (Cranial Nerve V). 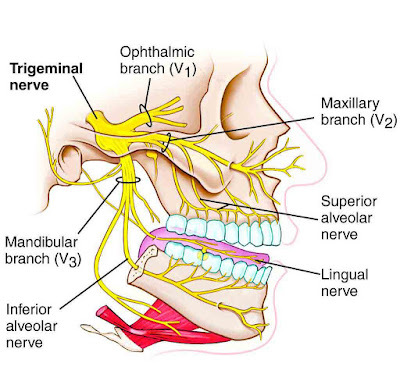 The device must be inserted into the nasal cavity far enough to contact nasal mucus membrane with trigeminal nerve branches (a technique that may require some training to do correctly). To prevent infection risk, the tip that contacts the nasal mucus is disposed of daily. Why is the eyecare world so excited about this new technology? It's the first dry eye treatment that results in immediate increase to tear production, and unlike eye drops, it does not involve any chemicals and their potential side effects from entering the body. It is a treatment that could be used as needed, as much or as little as a patient needs for dry eye relief, leaving the patient in charge of controlling their signs and symptoms of dry eye. 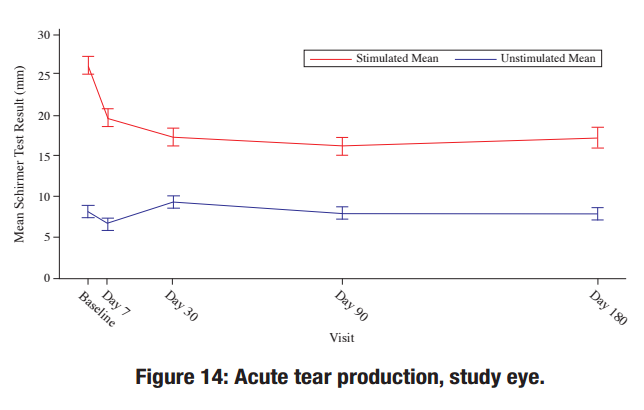 In a study of 48 adults diagnosed with dry eye disease (as defined by a Schirmer's score of less than 10 mm in 5 minutes and an OSDI score of at least 13), the TrueTear device produced significant increase to aqueous tearing compared to an intranasal device sham control. An average Schirmer score of 25.3 mm ± 10.7 was observed during active neurostimulation, compared with only 9.2 mm ± 7.3 for the sham control application. The mean difference between Schirmer score with active stimulation versus sham was 16.1 mm. A second study of 97 adults evaluated aqueous deficient dry eye patients for 6 months comparing a treated eye to an untreated fellow eye in the same patients. The inclusion criteria for enrolling in this study was a baseline OSDI score of at least 23, a baseline Schirmer test with anesthetic of ≤ 10 mm in 5 minutes, and corneal fluorescein staining in the same eye. Patients were instructed to use the device at least twice a day for no longer than 3 minutes at a time, and no more than 10 times a day for the enrolled "study eye." The fellow eye was not to be to stimulated. Patients were seen for follow-up on day 7, 30, 90, and 180. 9.4 mm on day 180. Based on these results it does appear that the initial tear production response to TrueTear is greater than it's continued response with time, and with continued use the effectiveness settles to a stable level after about 1 month of use. 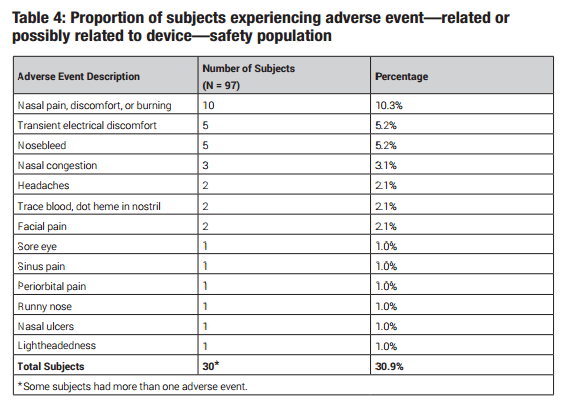 There were no serious adverse events reported in either clinical study. The most common side effects were "nasal discomfort" at 10.3%. Colloquial reports from company representatives stay that the device emits a "tingling" sensation, that could be strong enough to cause a sneeze when used on higher settings. That is why starting on a lower level device setting is advisable and only turning the voltage up if no sensation occurs. How often would my patients use this? 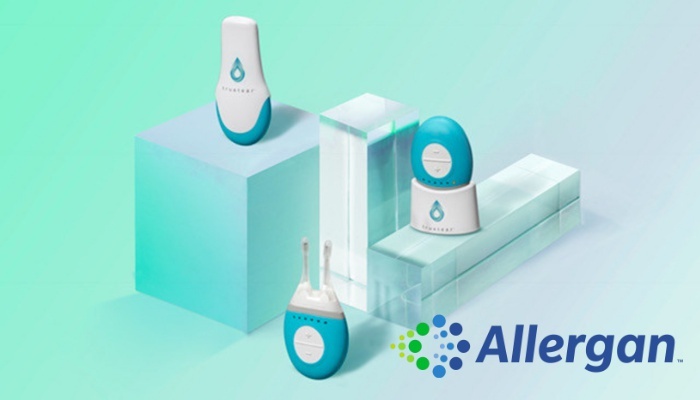 Allergan recommends starting with twice daily use at Level 2 setting, with stimulation times of up to 3 minutes per use for patients with dry eye disease and aqueous deficiency. The maximum usage possible is 10 times a day (the device is limited to only 30 total minutes of neurostimulation per day). There are multiple voltage settings, levels 1 to 5, to provide increasing levels of stimulation. Allergan is reporting up to 4 hours of improved tear production per use. At this time, Allergan is doing a limited roll-out to selected clinics specializing in dry eye. Later in the year broader availability is expected. Patients will be buying the TrueTear device itself, and packages of the nasal tip covers that require daily replacement. There has been no statement at this time about proposed costs. 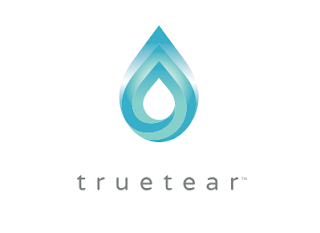 TrueTear is a prescription medical device that will require a physician's prescription, and training on its use. Have you tried TrueTear yet? We'd love to hear your experiences in the comments below! Is this product on sale yet? In the UK? Unfortunately the roll out off this treatment has been very slow! In the US it's still only available in a handful of test clinic sites. It is EXTREMELY expensive. Right now, standard cost in WA state is $700 with a monthly fee of $50 for replacement tips. With insurance plans they can reduce the cost. It would cost me $400 for the machine and $50 a month for tips. I tried the device in my doctors office and it failed to produce a single tear on level 5 for 2 straight minutes of use. I heard other patients who experienced the same issue and the doctor just kept saying to "find the sweet spot" and keep at it. Is TrueTear covered as a medical device or under prescription coverage? Because everyone's insurance is so different, it's best to call your medical plan and ask. You could also call your prescription drug plan and ask (but because it's not a medication, that is less likely). Are there plans to launch this product in the EU/ in Germany? How about patients with a high medical need, is it possible to travel to US and purchase this devise and the tips? I'm not sure of the details for international access, but you can go to Allergan's website directly and send them a comment or email! Dry eye disorders are widespread and rempunt. My suggestion as an ophthalmologist would be to keep the price low and affordable and make it available OTC! Hi I am looking for some patient reviews before making such an investment. Has anybody tested it already? Drug Rep came into the office yesterday, we tried it out! Works, lots of sneezing, one had major head pain afterwards and one no issues! We purchased 6 units at 650.00 per unit, will be a markup! Insurance does not cover any part of the unit. Will be a out of pocket expense plus monthly tips. I too wish to see unbiased patient reviews. Does anyone know if it's obtainable in the Boston area and who dispenses it? How would I know if it will work for me before spending a large amount of money? I have no US medical insurance and will just be visiting.